Happy Monday!! This Hydrangea Blue Dress is one of my favorites from our launch a couple weeks ago. It has been one of our best-selling dresses and can be worn so many different ways!! Dress it up with heeled sandals or down with flats, the options are endless. It will look so beautiful however you choose to wear it this summer!! I’m obsessed with the sleeves and movement too! Thanks for you comment! gosh i am in love with this dress!! the style is so timeless, and i love all three of these looks! So obsessed with this dress! Love it dressed down the most! Love how you styled this. I think the last one is my favorite. What a gorgeous dress! It was a tiny bit cool here this weekend, so this would have been a good bet. Love the button down detail! Thanks so much Carissa! You are so sweet! This dress really is a good option. 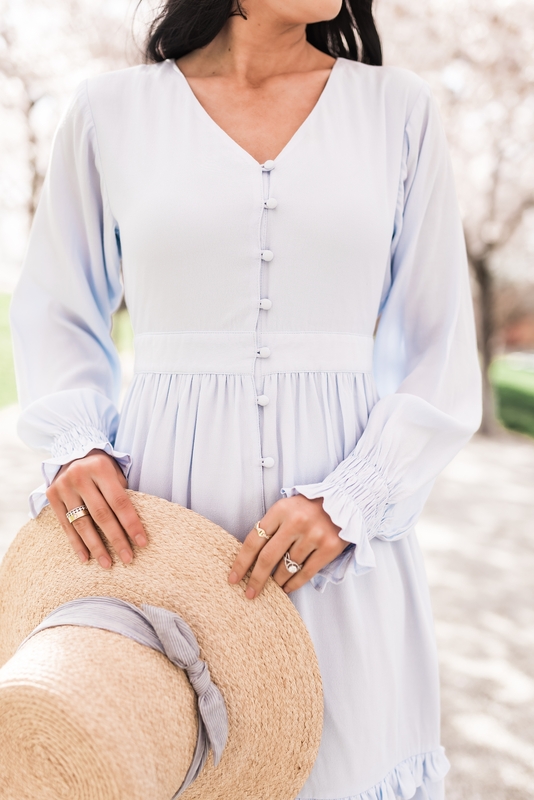 Beautiful pastel baby bleu dress … So cute and charming! ?♥️? 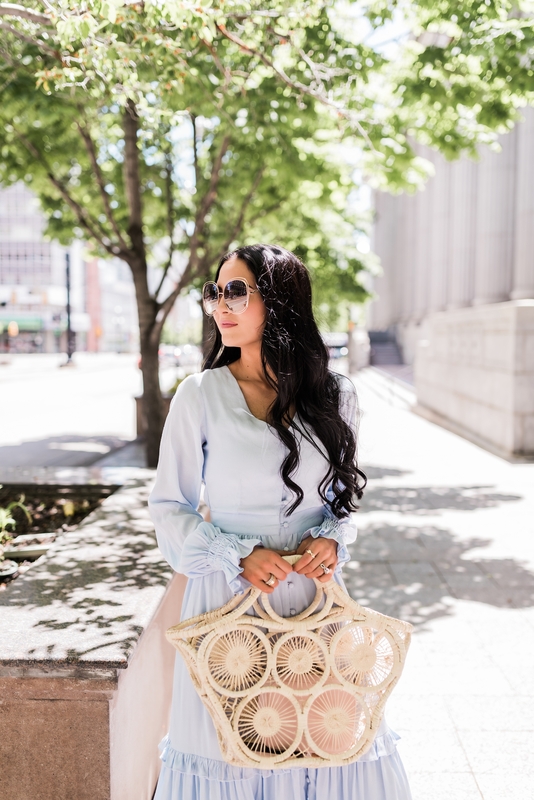 I LOVE HOW A SIMPLE HANDBAG AND SHOE change can make this dress feel like a whole new outfit! Hi Nicholle, Thanks so much! Accessories really can change up any look. I love look 1. 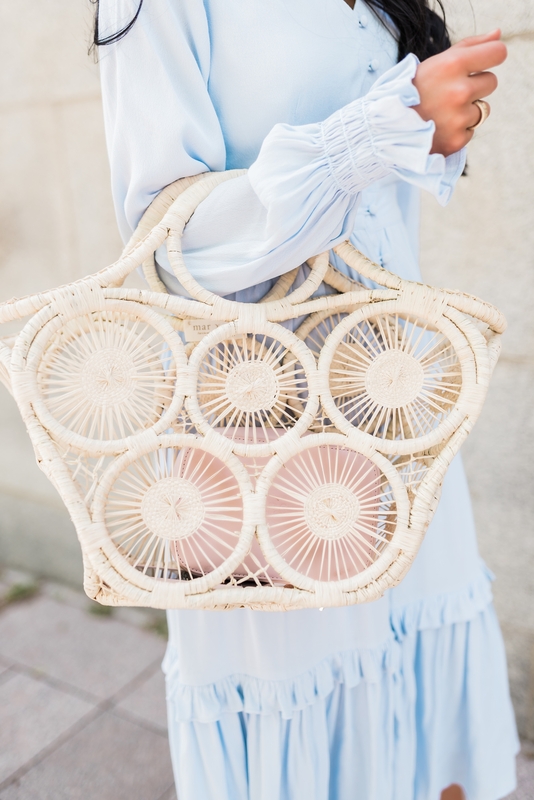 The circular blush handbag with this dress!?? Love all the three ways! But I think the first outfit is my favorite! I think it’s my favorite too! Thanks so much for stopping by! I’m CONFUSED, WHERE DO YOU GET A BUCKET WITH FLOWERS IN IT, DO YOU HAVE A SOURCE? aRE THEY JUST GROCERY STORE FLOWERS, OR DID YOU GO TO A FLORIST? Hi Mary, I actually found the bucket and the flowers at my grocery store. There are so many pretty hydrangeas and peonies out right now! 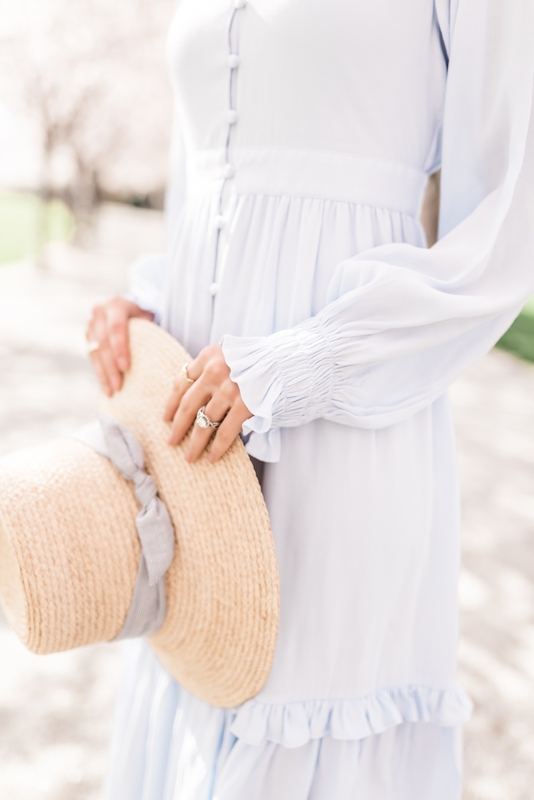 Okay loving this dress and loving all things pale blue this year. Literally just painted our tv room a Benjamin Moore pale blue! Gorgeous! LOVE the pastels and modest dress that looks so feminine! I’m obsessed with that blue dress! It’s gorgeous! I really love this dress! It’s the perfect color and style for spring and you’ve styled it effortlessly.